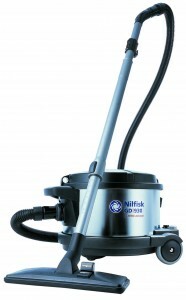 Only $549.00 for a fully-loaded Nilfisk HEPA Vacuum with a Beater Bar and all of the other accessories! Whether you are a renovation contractor, working on a client’s home or building, or a homeowner who wants to eliminate household dust and allergens from your home, this fully equipped, ever popular ConserveIQ Nilfisk RRP Rule HEPA Vacuum is a canister vacuum cleaner designed for solid performance in abusive environments. Its tremendous suction power, an amazing 92″ of lift, and durable construction make it a reliable choice for demanding applications, such as lead paint renovations, or even mold, lead, or asbestos remediation. A superior filtration system, including a standard HEPA filter, with 1890 square inches of filter area, ensures a safer and cleaner work environment. • This vacuum can be used in conjunction with vacuum-assisted power tools to collect hazardous lead debris at the source.